This media release is cross posted from the Aquarium's News Blog. A 175-pound, rescued loggerhead sea turtle from Cape Cod will celebrate Thanksgiving by being offered its first meal of herring and being transferred from its small, intake pool to a large tank. 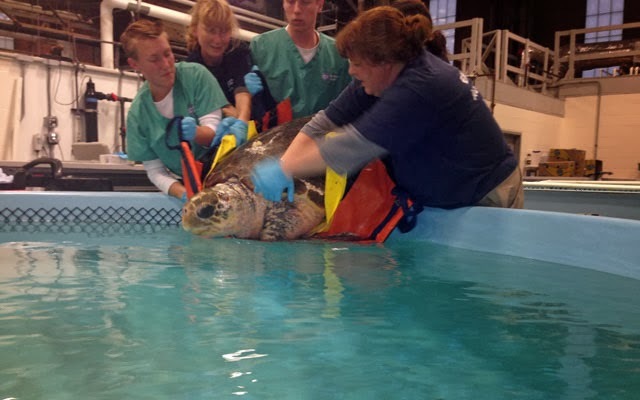 Several New England Aquarium rescue staff transfer a 170 pound loggerhead sea turtle into a larger tank after receiving some medical treatments after her re-warming. 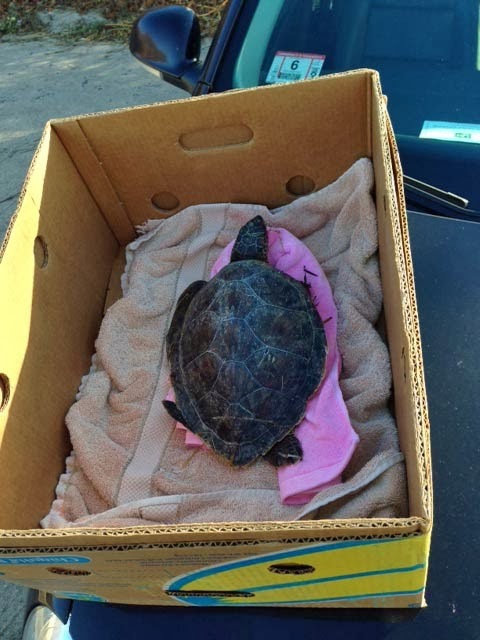 This thin, near-adult female was rescued from Crosby Beach in Brewster last weekend. She was caked in mud and barnacles as she was hunkering down low in the water column trying to avoid the frigid temperatures that gripped the region then. 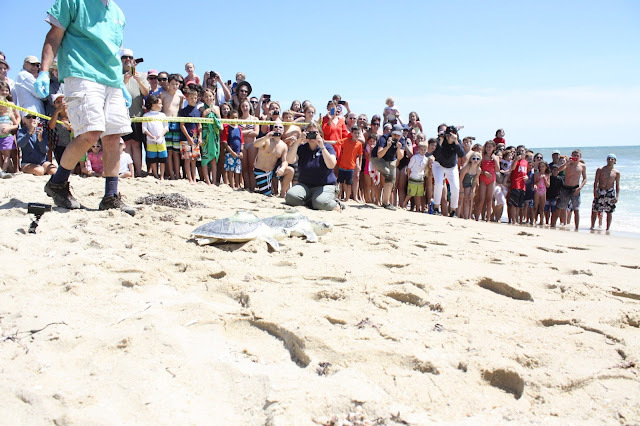 She is the second largest sea turtle ever rescued during the annual November/December cold stunning season on Cape Cod. Only a 225 pound turtle named Tiny rescued about a decade ago was bigger. Despite her large size, she is still very underweight. 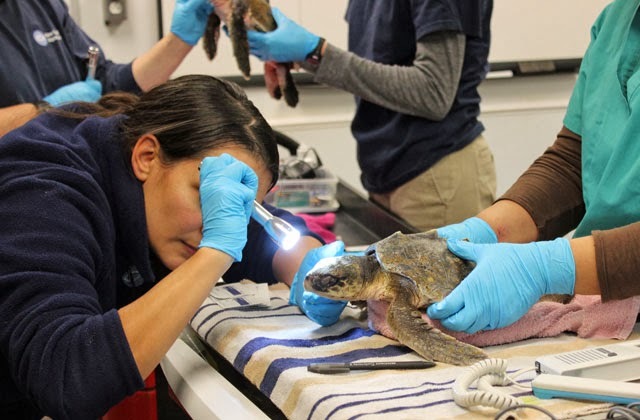 Aquarium veterinarians believe that she has probably been debilitated since summer with an underlying medical condition that has yet to be diagnosed and kept her from migrating south. In true Thanksgiving tradition, Aquarium staff were gleeful this morning at the prospect of fattening her up in the coming months. She will be named early next week. Each year, Aquarium rescue staff and volunteers pick a theme from which to choose names. Past themes have included national parks, detective novel characters and constellations. This year’s theme is breakfast cereals and their mascots! 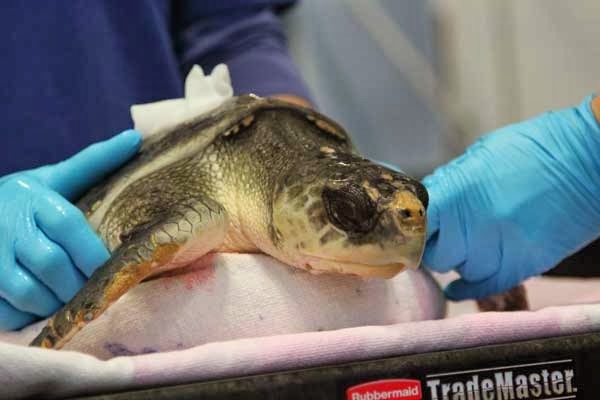 The stranding season this year on Cape Cod has gotten off to a very fast start with nearly 70 hypothermic sea turtles brought to the Aquarium’s sea turtle hospital in the old Quincy shipyard. 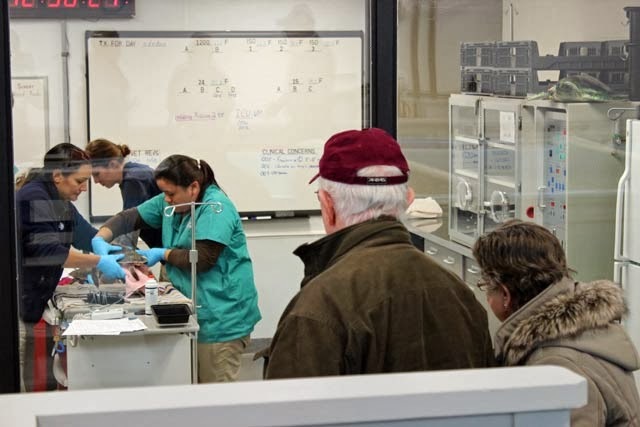 Eighteen animals have been re-warmed and stabilized and shipped out to other rehab facilities, including ten to the National Marine Life Center in Bourne and eight to the National Aquarium in Baltimore. 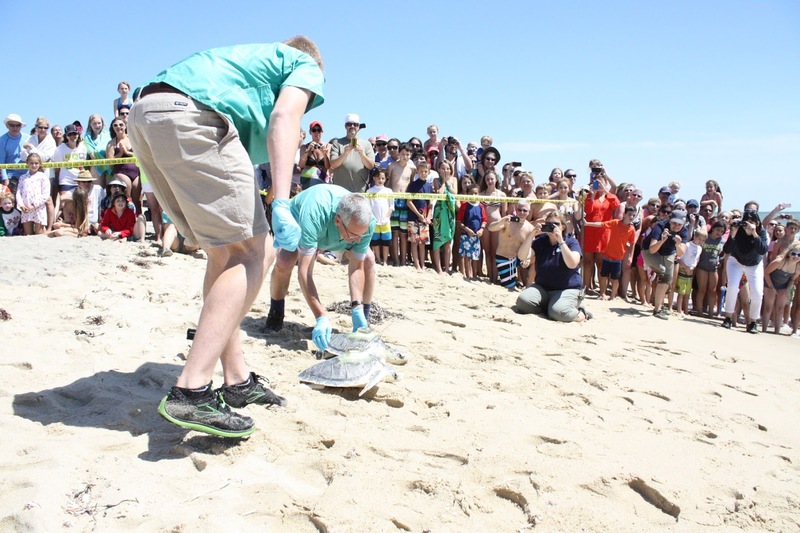 In this season of thanksgiving, the New England Aquarium is truly grateful to its stranding network partners from Florida to Maine which take in sea turtles that require months of rehab. 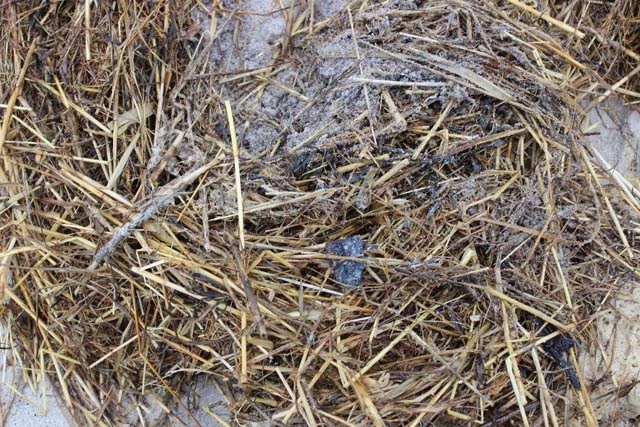 The recent cold weather has resulted in a higher percentage of small, stranded sea turtles dying on beaches due to exposure as overnight temperatures have been in the 20’s. Today’s storm with its very strong, southeast winds might result in some sea turtles being washed on the South Shore versus the norm of the Outer Cape. The Aquarium asks post-Thanksgiving beach walkers to keep their eyes peeled for unusual objects in the debris at the high tide line. 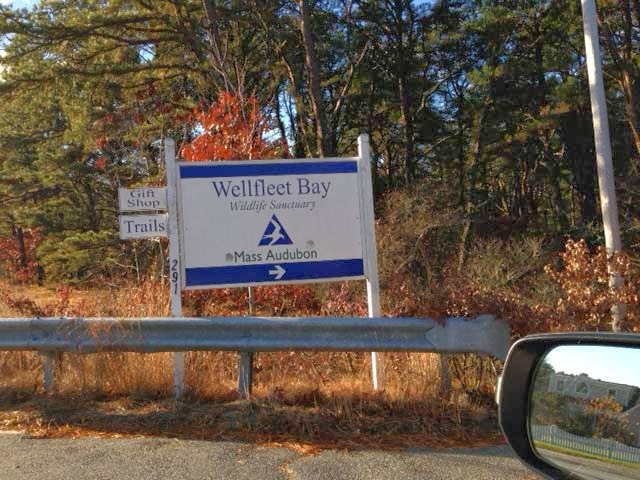 If someone finds a turtle, please call Mass Audubon at Wellfleet Bay at 508-349-2615. 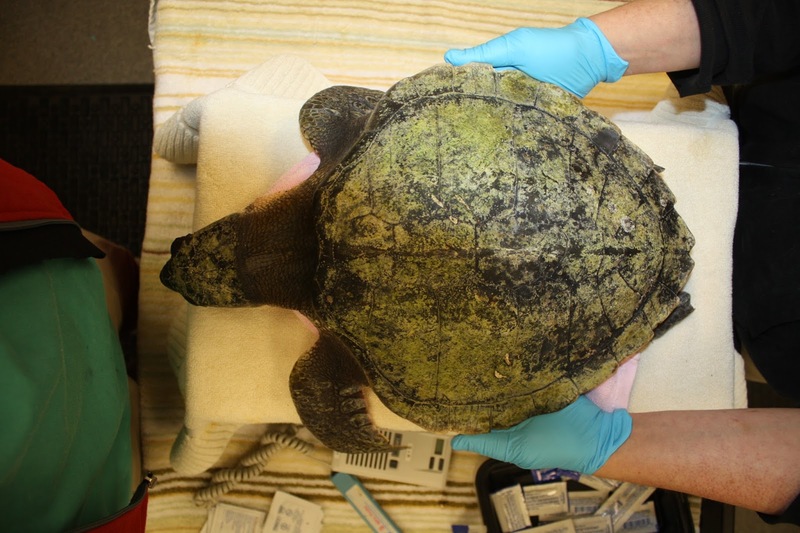 The 2012-2013 turtle stranding season broke all kinds of records at the Aquarium's Animal Care Center in Quincy. 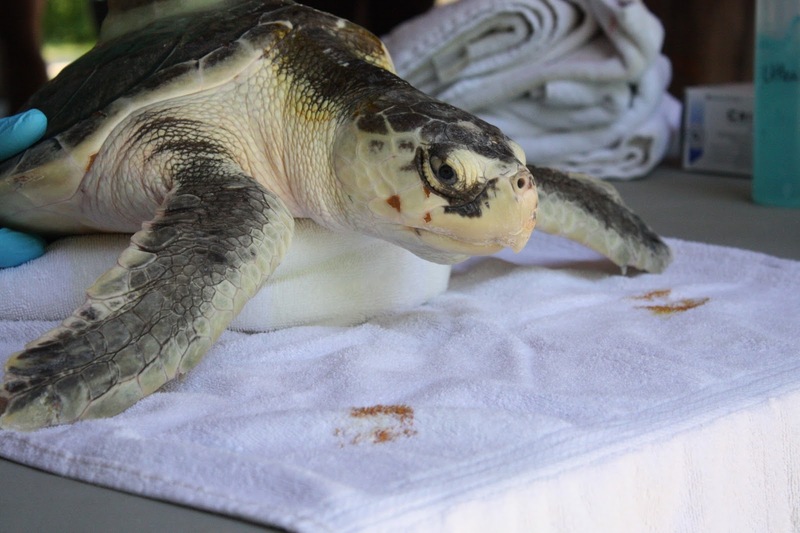 The Marine Animal Rescue Team cared for 242 turtles—in an average season we treat about 80. And 100 of those turtles were big (50 pounds plus) loggerheads. Despite the overwhelming number of patients, the Rescue Team had a release rate of 87 percent. 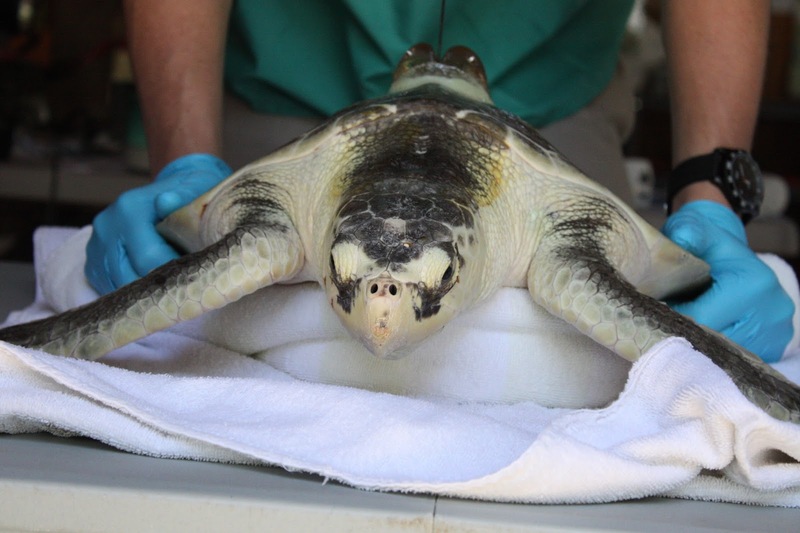 As the new stranding season begins (the Rescue Team is already caring for more than a dozen turtles at our clinic), we wanted to show you some of the last 2012-13 turtles to finish rehab and be returned to the ocean. These two Kemp's ridleys, turtle #164 (Frank Hardy) and turtle #197 (Benton Wesley), each stranded in December of 2012. Both of them needed a lot of expert care before they were ready to go back out to sea. 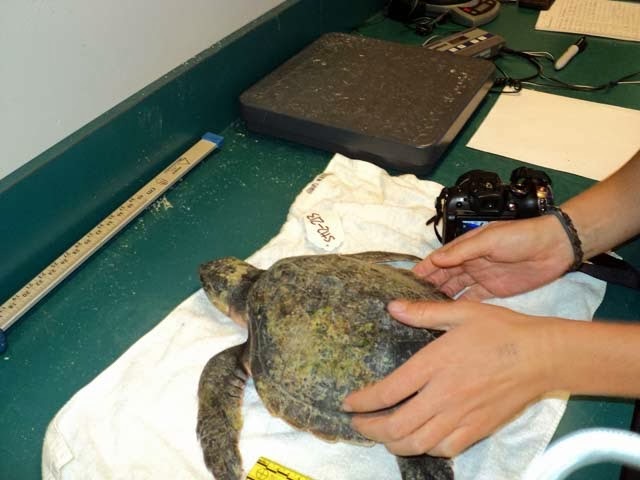 After nine months of antibiotics, vitamins and plenty of herring and squid twice a day, these two highly endangered sea turtles were finally strong enough to leave the clinic. They were fitted with satellite tags, and on a gorgeous day in late August 2013, Rescue Team members drove (and ferried) the turtles to Martha's Vineyard to the release site at the Trustees of Reservations Long Point Wildlife Refuge. From this site on the southern coast of the Vineyard, the turtles had open ocean in front of them. As you can see, they knew exactly what to do. See more pictures of this event on the News Blog. Want to help? 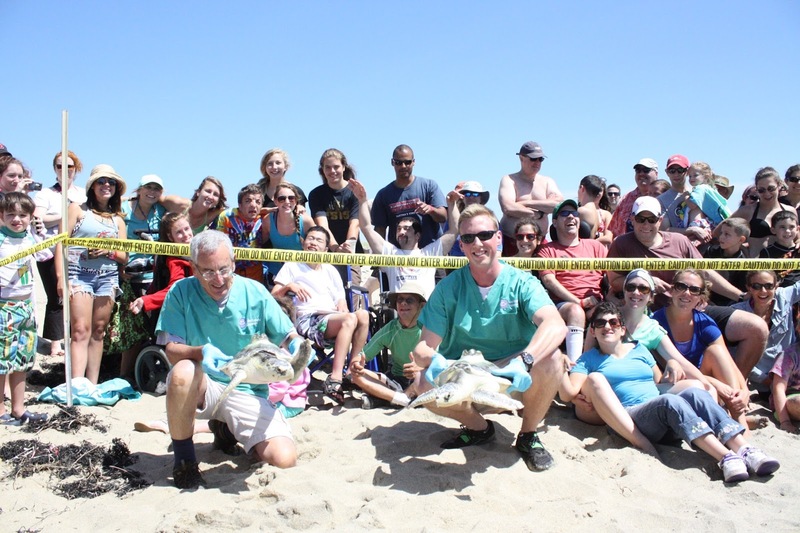 You can make a donation to support the Marine Animal Rescue Team's work and all the Aquarium's conservation efforts. 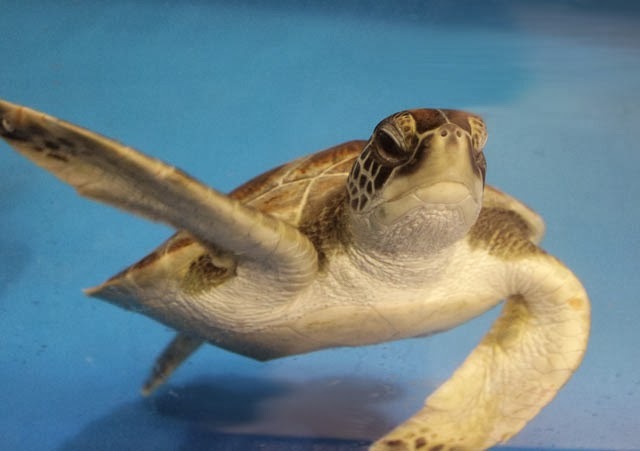 You can track the progress of these satellite tagged turtles at seaturtle.org. 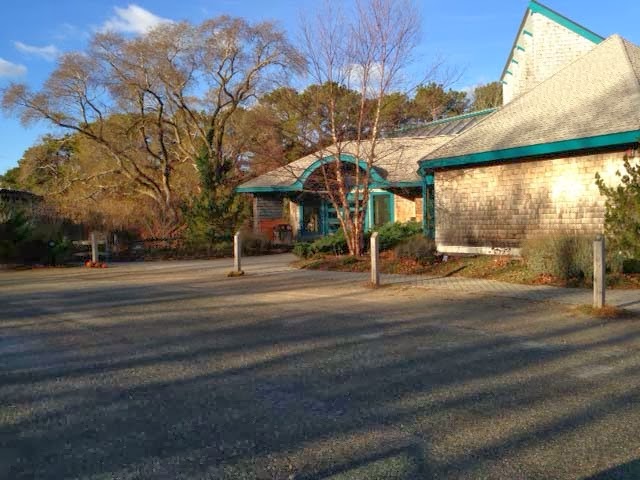 Martha’s Vineyard is a great place to visit this time of year. 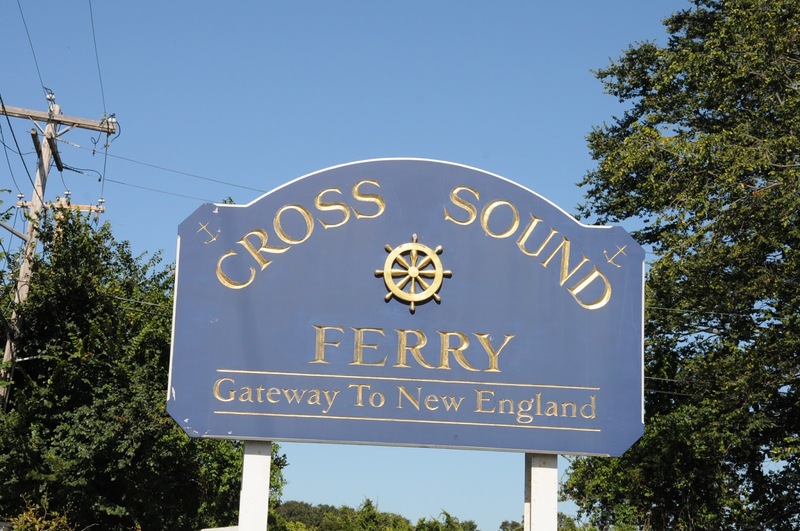 A picturesque summer time jewel nestled just offshore of Cape Cod, “The Vineyard” is home to countless boutiques, restaurants, and enough ice cream shops to satisfy all tastes. 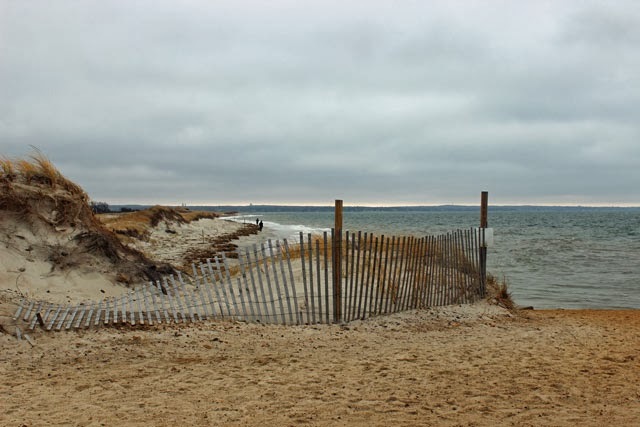 Martha’s Vineyard is also known for its beautiful shoreline and beaches. 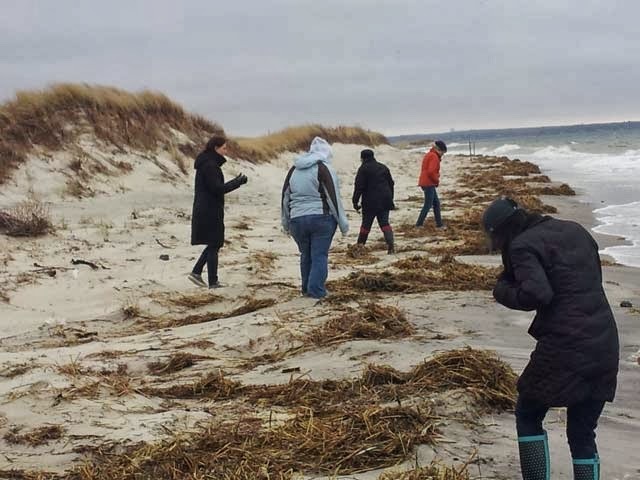 This past Tuesday, the New England Aquarium Rescue team, along with a handful of dedicated volunteers and a long list of special guests, paid a visit to The Trustees of Reservations Long Point Wildlife Refuge for a unique occasion. 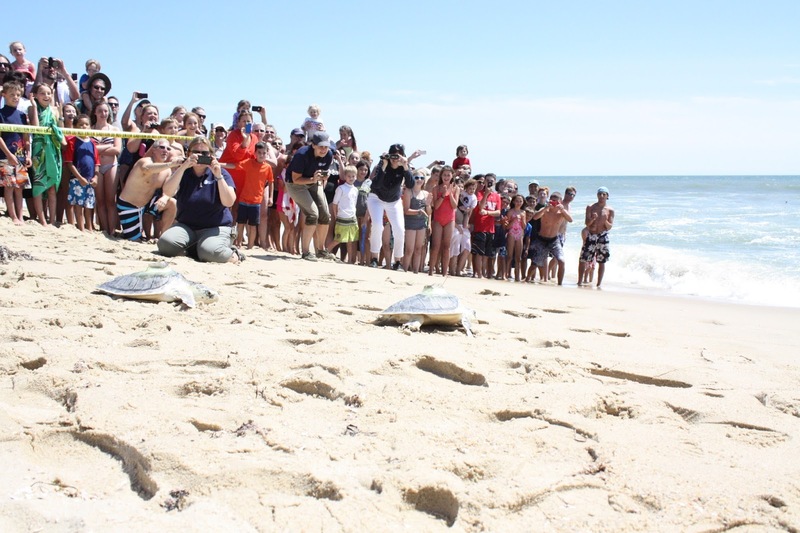 The occasion: RELEASE TWO CRITICALLY ENDANGERED SEA TURTLES BACK INTO THE WILD! The turtles being released were two Kemp’s ridley sea turtles; Frank Hardy (# 164) and Benton Wesley (#197). 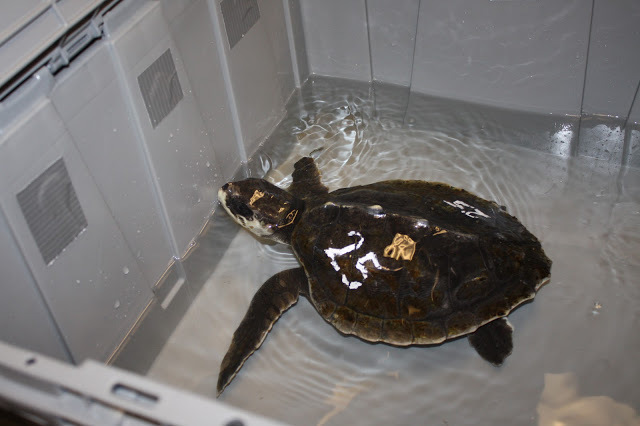 These turtles cold-stunned last winter, were rehabilitated at our Quincy animal care center, and now are ready for the waters of the Atlantic! There was a great number of people and visitors at the release site, all eager to see these two turtles released back into the wild.Volunteers Maury Weinrobe and Mike O’Neill show off these stunning turtles to the crowd, and take a special moment to share these turtles with the Camp Jabberwocky folks. There was a great feeling of excitement in the air, and everyone was curious about the antennas on their shells. If you haven’t noticed from the pictures, these two turtles were equipped with satellite tags! We are very interested in where the turtles go once they are released, and their progress can be tracked at www.seaturtle.org. 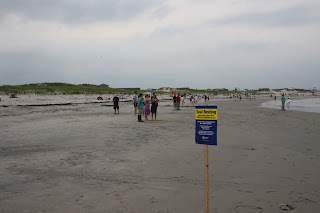 Follow the link "Track a sea turtle" and search for New England Aquarium. With the help of the Trustees of Reservations and Camp Jabberwocky, the Rescue team was able to release Frank Hardy( # 164) and Benton Wesley (#197) back into the wild. Long Point Wildlife Refuge provided a perfect backdrop and location to kickoff their journey homeward. So a BIG THANKS goes out to the Trustees of Reservations for providing a great release site. BIG THANKS also to Camp Jabberwocky for bringing out all their summertime campers. It was great fun having everyone out, and we hope you enjoyed it as much as all of us! 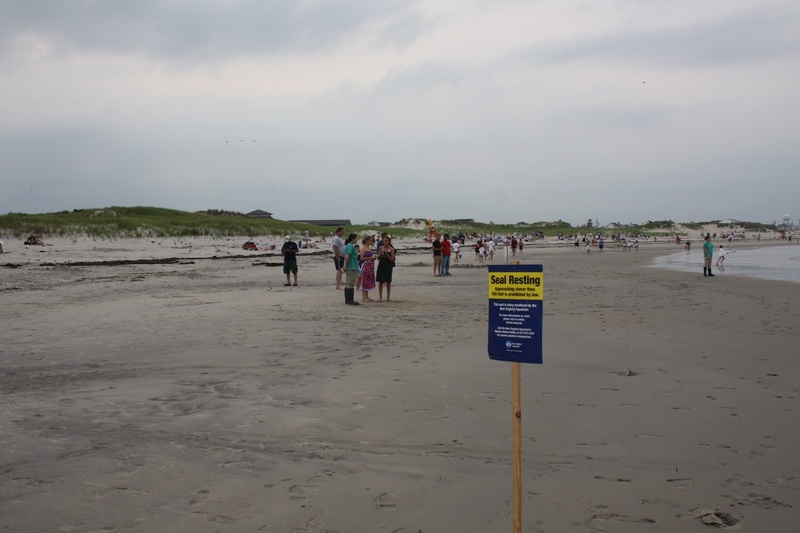 It is natural for seals to be in the New England area, and people want to help. This post is part of a series we’re calling Save the SEAL, in which we hope to address the most common questions and concerns we hear from people calling our marine animal hotline (617-973-5247). Learn what SEAL stands for in this previous post. 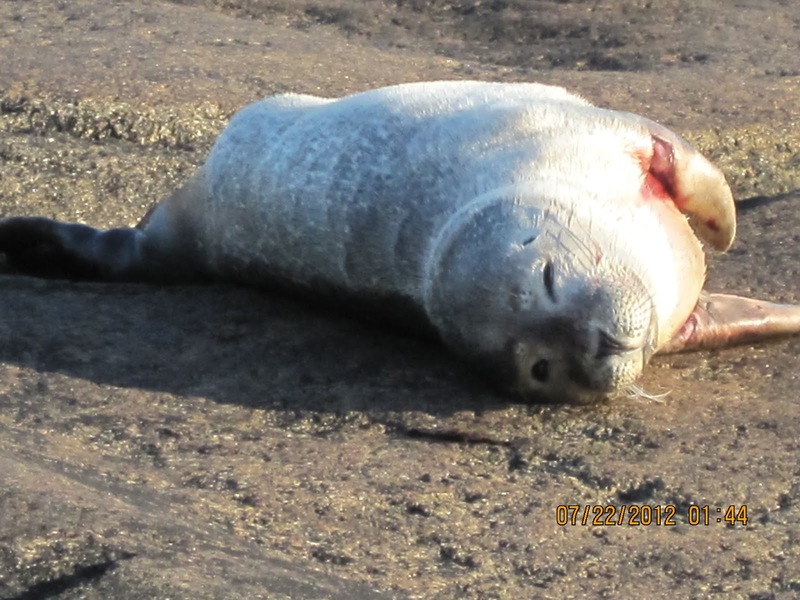 Warning: There are pictures of wounded seals in this blog! One concern that is voiced on the majority of calls to our hotline is “the flipper is broken”, “it can’t use the flipper” or “there is something wrong with its flipper because it won’t use it”. Today we will address those questions. 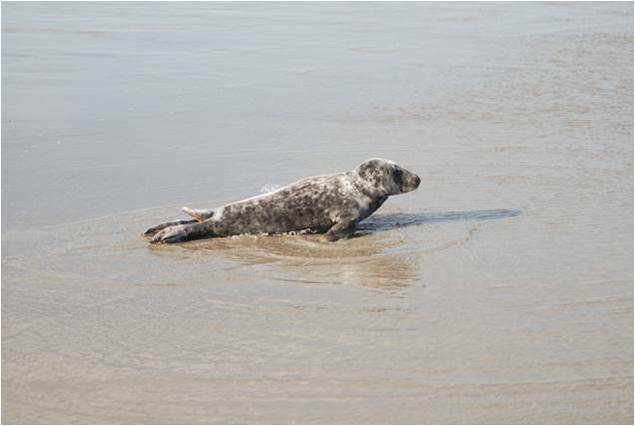 As most of you know from previous posts it is perfectly normal for seals to be out of the water and on land. 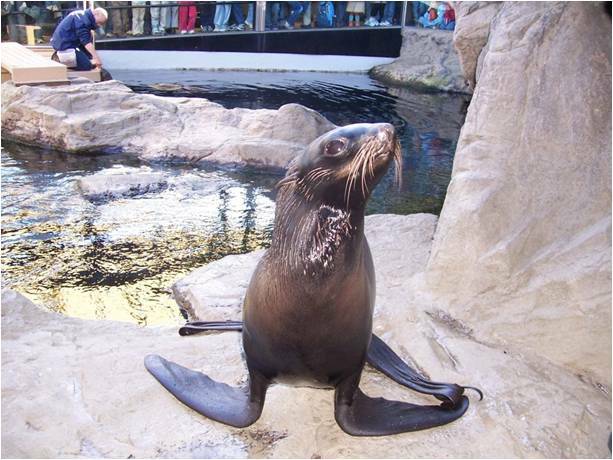 However, unlike sea lions or fur seals (both found in the Pacific and at the marine mammal center at the Aquarium) the true seals (family: Phocidae) are unable to rotate their hips and “walk” on land. 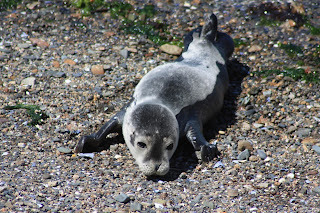 So the Atlantic seals look very awkward on land as they amble about. One of the NEAq fur seals. Easily "walks" around on all four flippers. The only place to find these seals on the east coast is at Aquariums. Here you can see a Gray seal lumbering up the beach. Not the most graceful of animals when they are out of the water. One thing we do see a lot of is the lack of use of one of the front flippers. While we are not sure why these seals do this, we see it often enough to realize it is behavioral. In the Aquarium’s history, we have cared for hundreds of seals with clinical problems other than broken flippers that have displayed this behavior while in rehab. Are there any obvious lacerations or deep puncture wounds on or near the flipper? The seal above has an obvious wound. This was a propeller strike. Not every injury is as obvious though. Is there lack of uniformity between the flippers, that is to say swelling of the flipper that is reported not being used? A good looking seal. Front flippers are uniform in size and shape. 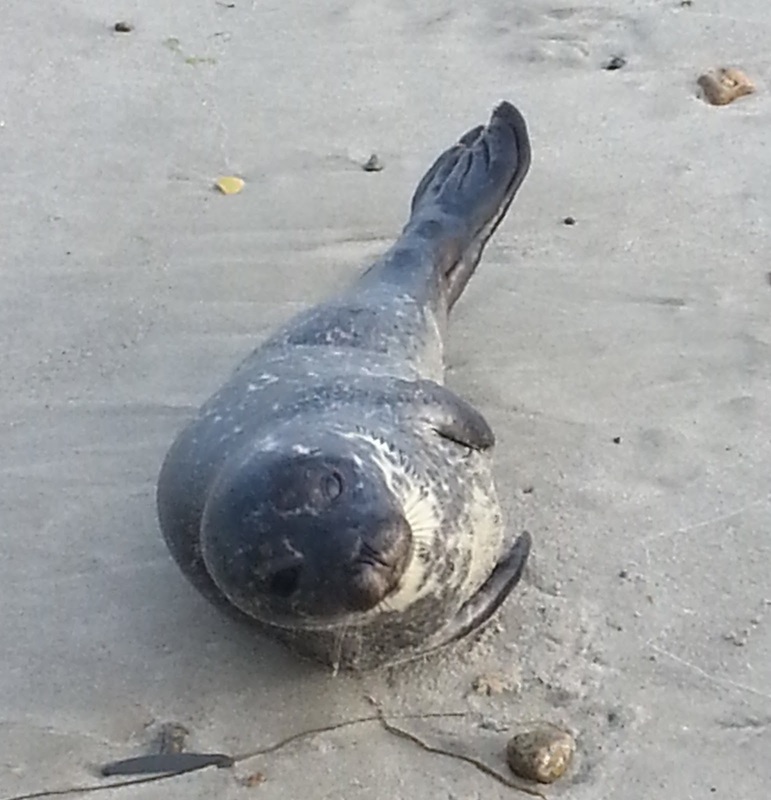 We monitored the seal while it was on shore. The seal scurried back into the water on the next high tide. Another seal where both flippers are uniform shape and size. Multiple reports were sent in by concerned citizens of a broken flipper. Trained visual assessment suggests otherwise. Unfortunately, this seal had to be relocated due to human harassment. However, since we had to move the seal anyway, physical exam proved both flippers were fine. Here you can see the awkward movement on land. But, what you might not notice is the front right flipper of this seal was swollen. 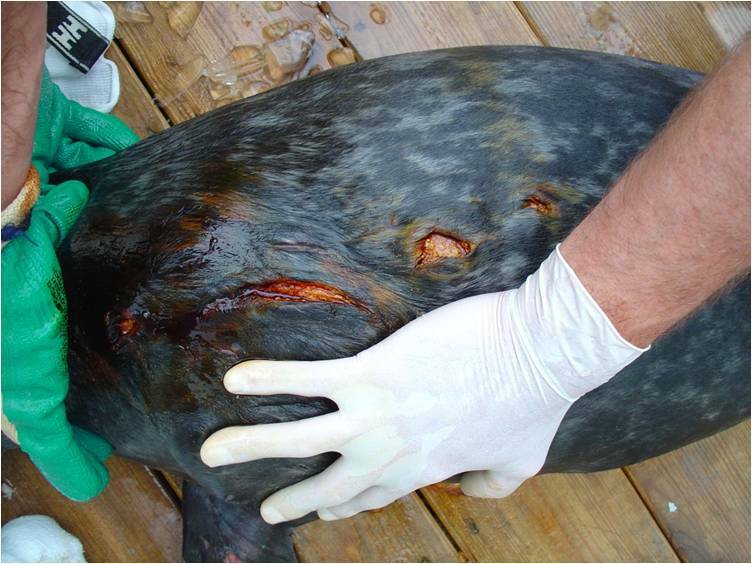 This gray seal was brought to the University of New England for rehab. 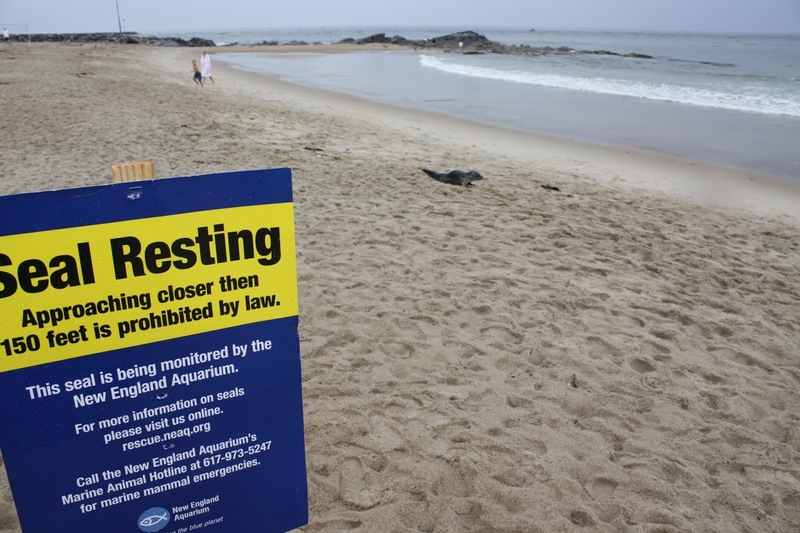 Just as we tell all of you, after we do a close-up inspection of the seal and find no reason to intervene, we will back off and let it get the rest it needs while on the beach. The above pictures show our department in the field educating and assessing a seal on the beach. The bottom picture shows the seal with plenty of room to do its own thing on its own time. These are wild animals and we would be putting undue stress on the vast majority of them if we had to physically restrain every seal to look at their front flippers. 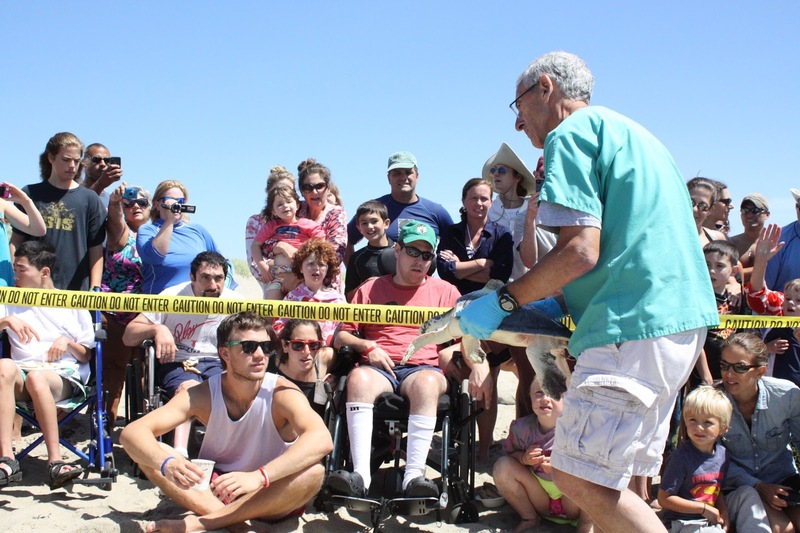 If our visual inspections finds something wrong with the flipper or something else clinically wrong, then and only then will we do a physical exam, which requires the removal of the seal from the beach. This is extremely stressful on the seal. This is why we only do this on animals that appear to have some clinical problem. In order to get a good feel of the flipper it takes multiple people to restrain even a small seal. Above we are palpating the shoulder and flipper. Very stressful. Another possible prop strike seal. Here we are palpating the flipper, ribs, and abdominal region to check for possible internal injuries. and the rehab facility will take radiographs. 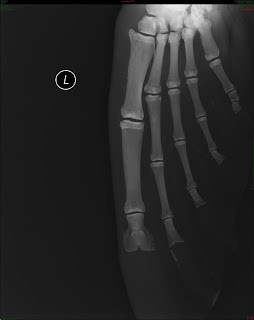 Above you can see a normal front flipper radiograph. I have been doing this for quite a while now and can thankfully only recount a handful of truly broken or infected front flippers. Stay tuned for more seal information.